It was a beautiful spring day – much like today in Dallas, when one of the seasoned sales guys at Digital Equipment invited me to lunch. He then posed a question I had never considered. That short conversation changed my life. Soon after, I made the transition to sales and to this day, I’ve never looked back. Why did I change to sales with an engineering background? Good question! Why are you in sales? What turns you on? Is it the thrill of the win? The commissions? Or is it satisfying and meeting customers? Here is my definition of sales- “Sales is the transfer of emotions from one person to another.” Sales is all about connecting with people. Its understanding how people are wired and then building trust based on what their needs are and not yours. 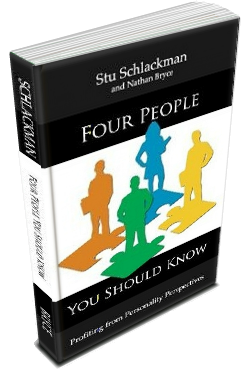 There are four key elements to understanding how we can best connect with others. First and foremost, what is their communication style? Do they come across as serious or sociable? Do they prefer to start a conversation with small talk to get to know you, or do they prefer to get right down to business? Are they the type that prefers to do the talking, or do they want to ask questions to find out about your company and its offerings? Connection is best when you let others communicate in the style they are most comfortable with. If you try to force your style on them it can easily lead to frustration, which rarely leads to connecting. No connection, no relationship = no sale. 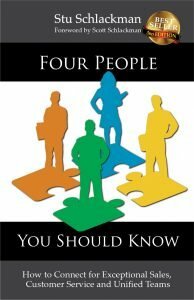 Four People You Should Know . Depending on their style, some people value expertise and knowledge, some relationships, others for the best financial investment and some value winning and looking good. We need to sell to the customer based on what they value most. And, good news – it’s fairly easy to find out – just ask! The third element to consider is their decision making style. Even though you make fast decisions and need few details – their style may be completely opposite. They may prefer slow with lots of details. Do they need to do lots of research or just go with their gut or a friend’s recommendation? All four personality styles make decisions differently. So if you’re dealing with a style that’s different from your own, you need to adapt to meet their approach. We run into trouble when we expect that the customer’s viewpoint is similar to ours – which is our default. We mistakenly think others think as we do. It doesn’t work that way. Have you ever been surprised at some of the decisions your prospects have made and you can’t understand why? Sure you have. They’re deciding from their perspective and not yours. The fourth and last element to consider is motivation. How are your clients and prospects motivated? Some are motivated to get a great buy, others to build relationships and others to obtain more knowledge and expertise. Are they more concerned with the business aspects or the personal benefits? You need to understand what motivates them if you want a decision in your favor. Selling is about connection. Connection and personality styles go hand in hand. Next time you meet a prospect the best thing you can ask yourself is – what’s their style? This approach will put the focus on them, which is where successful sales professionals want it. And in case you’re wondering – why did I leave engineering for sales? Because he was right – I do love people and was tired of spending my time with blueprints!